The Indian government has finally given in to Bangladesh over the Rohingya issue. External Affairs Minister, Sushma Swaraj, recently assured Sheikh Hasina that India stands fully with Bangladesh on the Rohingya issue and believes that Myanmar should stop the persecution of Rohingyas. This comes just days after India modified the stand taken by PM Modi supporting Myanmar. These repeated reassurances, while placing India on a so-called moral high ground, show a disregard for its own interests. Amidst the growing crisis over the issue of Rohingya migrants, pitting the Indian government against some vocal sections of the international community, the government has taken the right stand by declaring the Rohingya Muslims as illegal immigrants and seeking to deport them. Unjustifiably, the Indian government has received disgruntled criticisms from several international voices, most prominently those belonging to Bangladesh and from the United Nations. 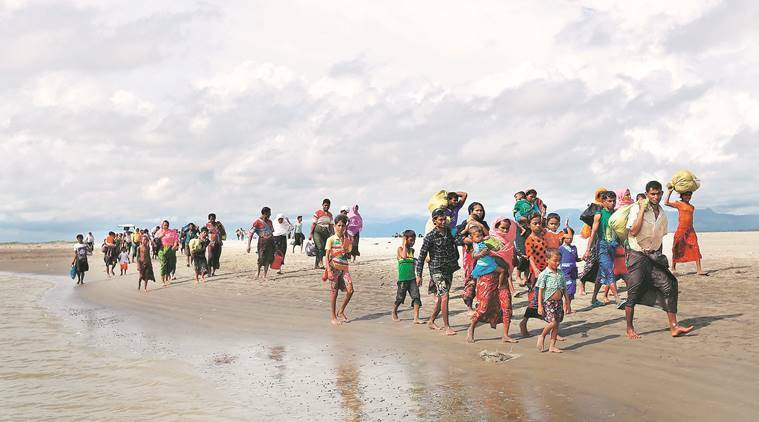 Many of our own countrymen – mainly Muslims and social activists – have also been protesting in West Bengal and Kerala, condemning Myanmar and clamouring for the Indian government to support the Rohingya. These are ridiculous demands, not the least because what is masquerading as morality is clearly a farce. An unfortunate and defining characteristic of our global society, which is itself turning brutal, self-centered and grosser by the day, is to take recourse to pretentious, false morality. The Indian government, in its handling of this entire issue, is being made to look as if it gives more importance to its national security concerns rather than lending moral support to a suffering, innocent community. This is exactly the kind of attitude that allows ‘crimes against humanity’ – various genocides in Africa in the 1990s – to continue unabated. The world – ostensibly led by a preacher United Nations – issues fulsome ‘condemnations’ and makes all the right noises, while, in action, a handful of powerful ‘liberal’ nations hobnob with the culprit countries. One may ask where did all these moral sentiments of the UN disappear when there was a genocide against the Kashmiri Pandits by the terrorists during the 1990s? Or, why isn’t the UN condemning the atrocities unleashed by Pakistan in Baluchistan, by a coterie of Muslim nations against the Kurds and by the now-preening Bangladesh against its own minorities in the Chittagong Hills? The Indian government is correct in trying to resist this hypocrisy. It is well-known that no amount of pressure by the Indian government will compel Myanmar to stop its atrocities – especially, since India has not always had smooth relations with Myanmar and Modi is now keen to cultivate those relations. Moreover, the basic fact is that Myanmar – whose citizenship laws are based on race instead of birth – considers Rohingya to be Bengali immigrants who entered from Bangladesh during the British rule and who fought on the side of the British Army to defeat the Burmese-Japanese forces. No amount of moral preaching that runs counter to the Burmese logic can possibly induce them to feel even an ounce of guilt. To the contrary, too much needling on part of India will create tensions with Myanmar and revive the threat of extremism in northeastern states – recall factions like NSCN, with which Modi has painstakingly forged some consensus over the last two years. Even then, when Modi returned from Myanmar, in deference to pressure from Bangladesh, India modified its stand on Rohingya issue by asking Myanmar to exercise ‘restraint’. The statement tried to balance the importance of lives of both Rohingya and Burmese security forces. But even this was not enough! Bangladeshi media and opposition politicians have been carrying out a highly poisonous campaign against India’s stand – also partly due to the fact that the Rohingya issue is all set to become an election issue in Bangladesh next year and has been deliberately catapulted into a communal Muslim versus Buddhist issue. This is rich coming from a country like Bangladesh, which has, till recently, committed severe torture and human rights violations against Rohingyas and Buddhists in Cox’s Bazaar and Chittagong Hills respectively. So much for morality. This is no ‘moral’ pressure. Let us be clear – the virulent Muslim political parties in Bangladesh are baying for India’s blood, as usual. And as usual, the persecuted Buddhist minority in Bangladesh’s Chittagong Hills – a highly persecuted and discriminated minority – will face the brunt, along with Hindu minority there, and are already getting nervous. If this really were about moral pressure, then surely, the Bangladeshis should have criticized China? China has lent clear support to the Myanmar government, saying that the latter is trying to ensure ‘development and stability’ in the Rakhine region, where the Rohingya conflict is taking place. But while India has been attacked even after modifying its stand in line with Bangladesh’s expectations and has even sent aid to Rohingyas in Bangladesh, Bangladesh is fawning over China, because it wants to play politics in the region by pitting India and China against each other by making itself a military and economic exploitation ground for the same. It has been playing this game for quite some time now. Furthermore, this unfair targeting of India and attempts to spoil its image in South Asia is being eagerly buttressed by the UN, which took the Rohingya opportunity to attack India on a series of internal law and order issues, all relating to minority Muslims. The UN never said anything about China’s stand on Rohingya issue or the fact that a prominent Nobel prize human rights activist died in police custody in China recently or about how China deals with dissent from Taiwan or Hong Kong or the East Turkistan Islamic movement – serious issues of proportions that are not even remotely present in India. It recognizes that China is entitled to its own business, as any country should be. Then why not India? And India is actually facing a very real and credible threat from the rising Rohingya numbers within its own territory. The fact the Rohingyas are altering the demography of Jammu has been noted by the government several months ago. There is also the fact that Rohingyas are now becoming a radicalized Muslim grouping – they belong to the Sunni sect – and have formed their own Arakan Rakhine Salvation Army (ARSA) to fight the military in Myanmar. The incipient ARSA is already getting support from Turkey and other Muslim countries and from ISIS, LeT, JeM etc. In fact, some leaders of ARSA have links with Pakistan-based LeT and are close to Hafiz Saeed, accused of being a major mastermind of the Kashmir insurgency. More than a year ago there were even reports that Kashmiri militants have started trying to rope in the Rohingya in Jammu for their Islamic cause in Kashmir and to wage war against India. Under such conditions, can India truly afford to encourage the Rohingyas? On the contrary, the first duty of the Indian state, in face of such national security threats, is to deport the members of the community (India has never committed any violence against the Rohingyas, as Bangladesh police has!). It is not only a national security obligation, but a moral duty which any government owes to its own citizens first. The political drama that has played out over the Rohingya issue is the result of efforts of the Muslim-minority lobby of the UN and of political considerations by Muslim countries and terrorist groups trying to expand their footprint in Myanmar. Under no conditions must India yield to such a ‘moral’ farce. So from now on, every time we read media reports villainizing India and sympathising with protests in Kerala and Bengal, let us remember the real politics behind it. Let us also remember the real roots underlying such vicious politics, namely, the increasing worsening cruelty and selfishness in the international system. The farcical reality of the system is the numerous liberal institutions it has built over the decades, but which have become a cover for countries to strike military alliances and position themselves for a war-like situation. Such a system has no right to preach morality to India. Next Article North Korean Crisis: Too Late to Turn Back?